Adjusted earnings-per-share were $1.08, compared with the FactSet consensus of $1.01, which excludes a 48 cent loss on an equity investment in JD.com, a 3 cent charge for foreign currency after the sale of a majority stake in Wal-Mart Brazil and a 1 cent benefit related to tax reform. Revenue rose to $124.89 billion from $123.18 billion, below the FactSet consensus of $125.42 billion. Wal-Mart now expects fiscal year 2019 adjusted EPS of $4.75 to $4.85, in line with the FactSet consensus of $4.80 and representing an increase from a previous guidance cut announced in mid-October. 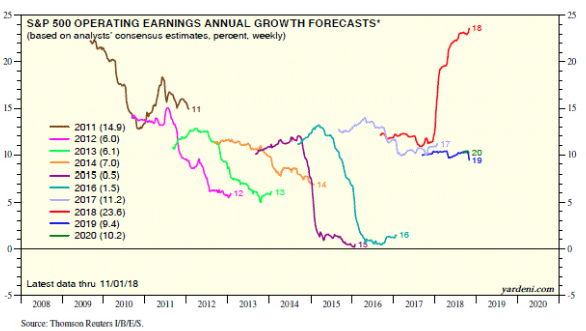 S&P 500 Q3 earnings are now expected to blow away forecasts, coming in around 28% growth, the highest rate of growth since 2010. But what’s overpowering the market from going higher and pushing it lower since October is the fear of an economic slowdown that may come sooner than anyone had expected. 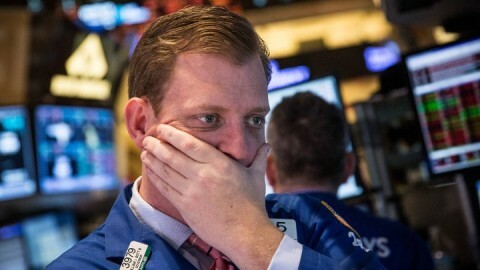 CNBC’s Jim Cramer discussed this unforeseen condition Thursday evening. 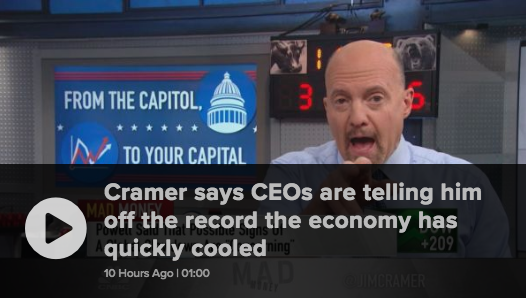 Cramer has been warning investors for weeks about a manmade slowdown in the U.S. economy, fueled by the two-pronged pressures of the Federal Reserve’s interest rate hikes and the Trump administration’s tariffs. Now, high-profile CEOs are worried about growth slowing so drastically that it could actually hurt the economy, he said. Where once a post mid-term election rally was the anticipation of investors, it seems to have faded all too quickly and been replaced with heavy selling. 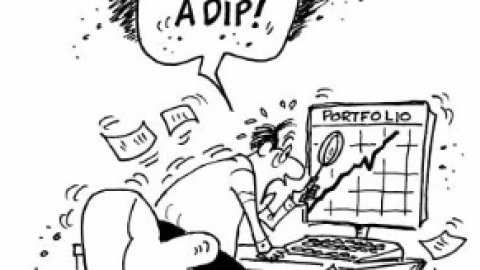 “Buying the dips” has been replaced by “selling the rips”. Aside from a potential economic slowdown that hasn’t yet found itself planted in the economic data, the Fed is weighing on investor sentiment and certain areas of the economy such as housing. But on Thursday it seemed that Fed chairman Jerome Powell is attempting to walk back his language that hints the Fed is on rate hike-auto pilot in favor of acknowledging certain aspects of the economy are slowing and could slow further. Powell has realized his job is to taper the “end-of-cycle talk” that has been filtering through the stock market and the broader economy and that many see as being tied to his rate hikes and the president’s tariffs. Fund managers very clearly believe the best days of the market, for the current economic cycle, are in the rear view mirror. 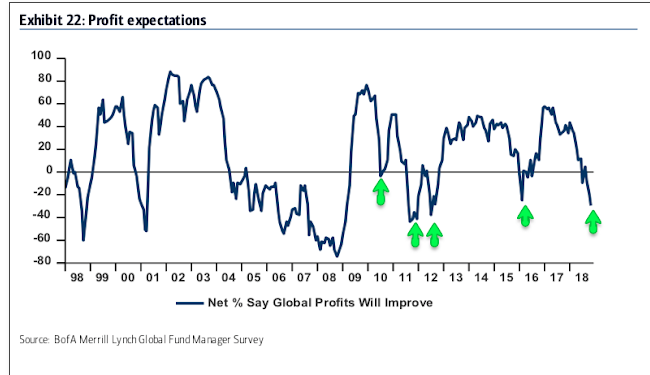 On a net basis, fund managers expect profits to deteriorate in the next 12 months, their most bearish view in 6 years. Negative profit expectations also marked equity lows in mid-2010, late-2011, mid-2012 and early 2016 (arrows). Although equities rebounded sharply on Thursday, investors will have to see if any rebound has follow through. At the lows of the day Thursday, the Dow had fallen greater than 300 points and before rising on news that China tariffs were on hold. The Financial Times reported Thursday that U.S. Trade Representative Robert Lighthizer had told some executives the next round of China tariffs are on hold, citing a person familiar with the matter. But later in the afternoon, Lighthizer’s office told CNBC, “Ambassador Lighthizer has made no representations to industry executives that future Section 301 tariffs are on hold.” The statement said the plan for tariffs outlined in September “has not changed at all. Any reports to the contrary are incorrect.” And with the contradiction to the Financial Times report, U.S. equities are pointing to a lower open on Friday. What was also interesting about Thursday’s trading session is that it brought the S&P 500 right back toward the weekly expected move of $50 and with options set to expire on Friday. The market remains highly efficient, but it remains to be seen if the SPX can finish the week within the $50 expected move. Chinese indices finished positive once again overnight and most European indices are higher in the early morning hours as Brexit issues remain at large. It seems unwarranted, but two dominating factors looming over the FUTURE of the economy have firmly taken hold in the marketplace. Nonetheless, we must continue to understand the current state of the economy, which is largely consumer-oriented. 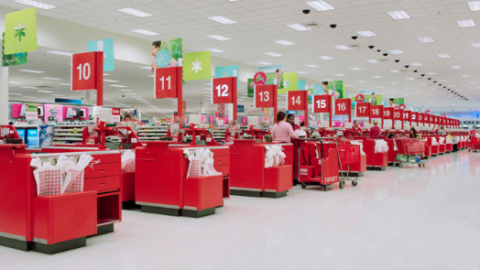 Thursday’s release of the October retail sales data proved to shed some light on the economy and consumer trends. Retail sales leaped 0.8% last month, the government said Thursday. 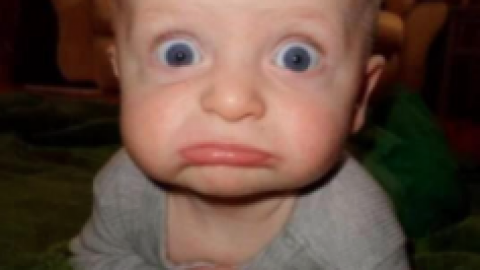 Economists polled by MarketWatch had predicted a 0.6% increase. The increase follows small declines in September and August. The government initially said sales rose slightly in both of those months, but in its latest estimate it revised the figures lower. The government said sales fell 0.1% in September and August, instead of rising 0.1% as originally reported. That could also result in the government trimming the initially estimated 3.5% growth in gross domestic product in the third quarter. Sales jumped 3.5% at gas stations, mostly reflecting higher prices at the pump. Sales of new cars and trucks increased 1.1 percent. 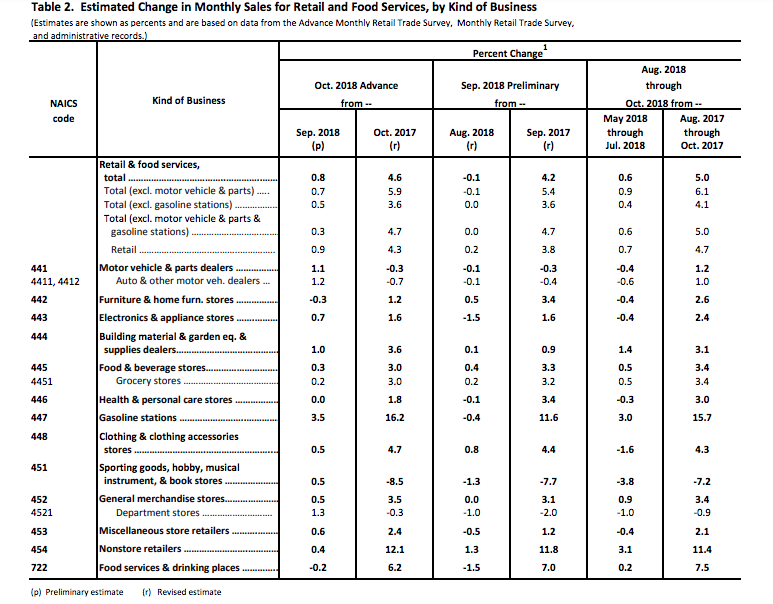 Overall retail sales rose a more modest 0.3% if gas and autos are stripped out. Department stores reported a 1.3% increase in sales and home centers saw a 1% gain. 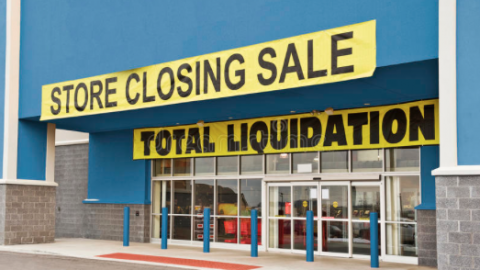 Sales fell for restaurants and stores that sell home furnishings. While the headline MoM retail sales number rose .8%, the YOY rise was also very strong. Year-over-year retail sales grew 4.6% with the biggest category of sales growth coming from gas station sales and followed only by Nonstore sales (e-commerce) that grew over 12 percent. 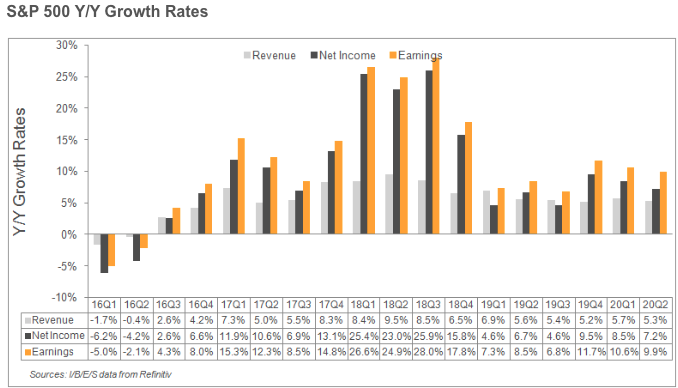 Me vs. them: My estimates for earnings growth during 2019 and 2020 have been lowered to 4.9% and 5.3% from 6.8% and 8.8%. I am predicting S&P 500 earnings per share will be $162 this year, $170 in 2019, and $179 in 2020. During the Nov. 8 week, the comparable Wall Street analysts’ consensus estimates, respectively, were $162.67, $177.69, and $194.55. Revenues slowdown ahead: The growth rate of S&P 500 revenues has been remarkably strong this year, which has contributed—along with the corporate tax rate cut at the end of last year—to the strength in earnings growth. Revenues per share rose 11.2% year-over-year during the second quarter, the highest growth rate since the second quarter of 2011. Industry analysts are expecting a slowdown in revenues-per-share growth from 8.5% this year to 5.5% in 2019 and 4.4% in 2020. That makes sense to me, since the trend growth rate of revenues has been roughly 4.0%. In addition, the global economic outlook is deteriorating, as evidenced by the weakening trends in recent months in both the OECD Leading Indicators and the Global Composite PMI. Profit margin unlikely to set new records:What doesn’t make sense to me is the implication of analysts’ consensus earnings and revenues estimates that the S&P 500 operating profit margin will continue to climb to record highs. Their latest numbers imply that the profit margin will rise to 12.4% in 2019 and 13.1% in 2020, from 11.9% this year. Thomson Reuters data show that the operating profit margin rose to a record-high 10.9% at the end of 2017 before the corporate tax cut. After the cut, it rose to fresh record highs of 11.9% during the first quarter of 2018 and 12.3% during the second quarter. Although Yardeni has reduced his expectations for future earnings, revenue and operating profit growth for 2019, growth is still the expectation. What investors are still struggling with is how much of the slowdown will be realized. Moreover, with earnings growth expected to slow, how much will rates rise? 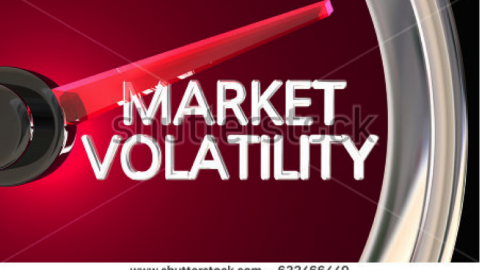 The conundrum amongst the investor community has obviously been highlighted by the elevated level of volatility in the market that has been ongoing since October. The economic data calendar is light for Friday. We’ll hear from two Fed officials on Friday in a speech from Charles Evans at 11:30 a.m. and the Fed vice chairperson Richard Clarida, who will appear on CNBC’s Squawk Box at 8:00 a.m. EST. Investors will bee keenly listening for any signs that the Fed understands the concerns surrounding the potential for an economic slowdown and how they intend to tackle a slowdown by way of measured rate hikes or pausing rate hikes in favor of exercising greater data dependency. Regardless of what the trading day brings, and with equity futures continuing to trend to the lows of the premarket, Finom Group will look for those daily, profitable trading opportunities. Below is a screenshot from our private Twitter feed, trade alert completed on Thursday. The Fed vice chair’s discussion on CNBC may be the deciding factor for the direction of the market on Friday. 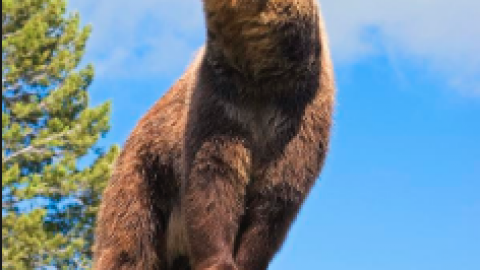 Clarida will either lean more dovish or hawkish with his commentary and the markets will likely follow in his lead/lean. 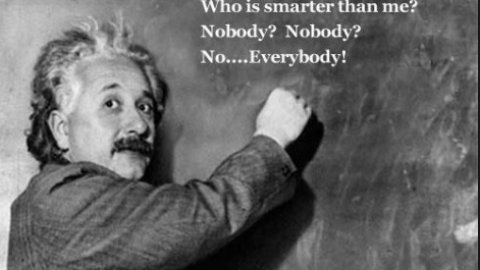 Have a great trading day folks! Markets Go On A Wild Ride: What’s Next? To Buy The Dip or not? That is the Question! Does Powell Hold the Key To Year-End RallyHeadwinds Compressing S&P 500 Multiple: Probable Outcome?